Please feel free to email me links to your own versions of the Kol Nidre or other versions you would like to see shared on the site. Great news. New version added to the Project. Called ‘Redemption’: The Patty Chan Kol Nidre, or ‘Kol Nidre goes to China.’ It’s composed for erhu and performed by Canadian composer Patty Chan who is accompanied by double bassist Marjolaine Fournier on viola da gamba. Chinese language press release. Lovely discovery: A version of the Kol Nidre for classical guitar composed by Sid Robinovitch. Kolnidre.org makes list of top Kol Nidre sites. World Premiere: Getting close. Saturday February 28th, 2015; Lovely note on the Guitar Society of Toronto Website. The Kol Nidre Project is being rocketed into the next decade by none other than Nicolas Jolliet, this time, with “Kol Nidre Goes into Outer Space”, which he composed and performs through creative uses of the Theremin, analog modular subtractive synthesis and electric guitar. It has been ten years since The Kol Nidre Project was born with Nicolas Jolliet’s version for sitar, surbahar, tabla, oud, doumbek and other exotic instruments, called “Kol Nidre Goes East”. Over the decade, two new versions were added to the Project: Roger Scannura’s version for Flamenco guitar, called “Todos los Votos” – and Patty Chan’s ”Redemption” for erhu accompanied by Viol da Gamba. Now The Kol Nidre Project is being rocketed into the next decade by none other than Nicolas Jolliet, this time, with “Kol Nidre Goes into Outer Space”, which he composed and performs through creative uses of the Theremin, analog modular subtractive synthesis and electric guitar. Nico’s new Kol Nidre blew me away when I first heard it – as it does to this day – for its originality, musicality, and above all, its spirituality. About a year ago (in August 2016), while dining in a Pho restaurant near his Queen Street West area Toronto studio (affectionately known as “The Church of the Bon Vivant”), I asked Nico what instrument he thought should be featured in the next entry of the project. He thought, he thought, and he thought, and then he firmly replied, “The Theremin”. That evoked in my mind a weird contraption invented by a Russian spy in which the performer made musical sounds by moving his or her hands in the space between two metal antennas – one related to volume and the other to pitch. A musical instrument in which the hands never touched a bow, a key, a string, or any object whatsoever. Just hands dancing through space. “Exactly”, Nico explained. The Theremin was an excellent choice because of its unique capacity to create captivating extraterrestrial sounds like the ones used in 60’s and 70’s sci-fi films to ironically connect with the ‘inner space’ of human beings. Nico’s exposure to the Kol Nidre over the decade had taught him that the power of the Kol Nidre over the centuries – its appeal to Jews and non-Jews all over the world – lay in its magical access to ‘inner space’, and introspection. Nico was no stranger to ‘inner space’. He spent years practicing deep Indian classical ragas on his Sitar and of course grew up listening to Pink Floyd. But Nico chose the Theremin not just because it would allow him to place the Kol Nidre in outer space, but because it would integrate well with the old school subtractive synthesis modular system he had just finished assembling and was starting to experiment with. He would use the Theremin not only as an instrument but as a voltage controller he would pass through the modular system and guitar fx chains in order to modulate other tracks in the arrangement. Before we left the restaurant I readily agreed with Nico’s suggestion, and before long Nico began immersing himself in the ‘60’s sci-fi vibe, which is what the Theremin had often been used for in the past. 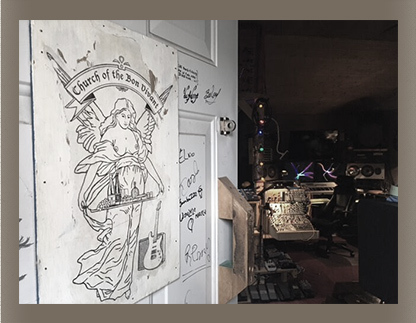 Back in ‘The Church’, he began composing his new Kol Nidre by using electronic sounds, radio waves and white noise, to put himself into a cosmonaut suit and begin the lonely drift into the unknown space – an intimate, reflective, awesome space – by using a minimalized line delay simplified guitar line that would carry the listener into that strange world. As Nico put it, “the guitar lifts you up there to the space station where you meet the Theremin 4 minutes into the piece”. Nico also explained that the conventional Kol Nidre would have to be adapted to allow him “to stay alone in my space suit, and look at the earth from afar, from my solitude, in order to pray for forgiveness from afar”. Realizing that this would be a truly challenging task, I ask Nico what knowledge or experience he had drawn on, to solve a compositional problem of such complexity. The Theremin is radio based, so I also used radio waves in the modular. I actually generated noise for the bass oscillators by connecting a shortwave radio antenna on top of the studio to a shortwave receiver hooked to envelope followers on the modular system. “This way I really felt like I was in space, and was actually physically, electronically linked to the shortwaves of the atmosphere above. Being in space made me slow the theme, brought me to the prayer, and induced the extraordinary meditational state that is the magic of the Kol Nidre”. When I finally heard Nico’s Kol Nidre, months after our lunch in the Pho restaurant, I was in awe at what Nico had accomplished from a musical, technological and spiritual point of view. As Director and Producer of the Kol Nidre Project, Nico has caused me a challenging problem: This will be a very hard act to follow! Harold Levy: Director; The Kol Nidre Project.